It was my name day on Friday. My husband’s, too. And twelve years after we met. And baby Elena’s first name day. For this special weekend I made two favorite desserts. Lemon bars for us and strawberry tart for sweet Elena. Both are Vicky’s “tastefull” recipes. 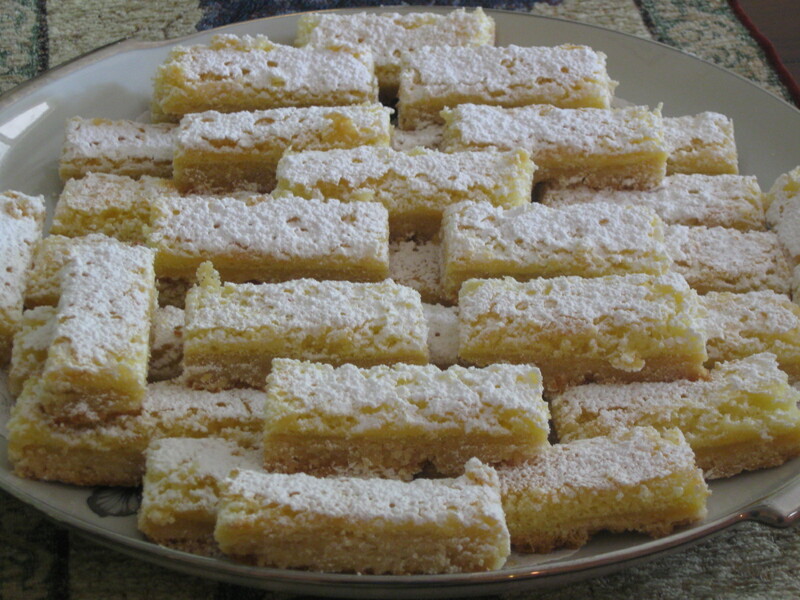 Vicky brought the lemon bars at the 9th Greek GGD event and they were voted 1st in tough competition against brownies, madeleines and cookies with cream cheese. Try them and you’ll see why. How to make: Mix the crust ingredients (the butter cut in pieces) to make the dough. Do not over mix. Just enough to form a ball. Wrap the dough in cling film and let it rest in the fridge for a while, about 15-30 minutes, so it’s easier to work with. Cover the bottom of a pan with parchment paper and when the dough is ready, spread the it evenly. Use the cling film so your hands won’t get sticky. You need to be a little patient here and squeeze the dough gently until it’s all spread nicely. Bake the crust in pre-heated 350F/180C oven for 20-25 minutes. When the crust is ready and cooling off, start working on the cream. Use a mixer to beat the eggs with the sugar well, until you get a fluffy, white texture, about 5 minutes. Add the lemon. Stop the mixer and fold in the flour, baking powder and lemon zest. Pour the cream over the crust and bake for about 20-25 minutes or until a toothpick comes out clean. Let it cool off. Top with confectioner’s sugar. When it’s totally cool, cut the bars and serve. Handle with care and use a spatula to take them out as they can be fragile. Notes and tips: Be sure to set the oven at the right temperature. This time my oven had a problem and got overheated so my lemon bars overcooked and came out a little dry, as you can probably see in the photo. I’ve made them before at the right temperature and guarantee that if you pay attention to the temperature and do not overcook the top part remains nicely soft and moist. Last Saturday we were invited to visit friends in Delaware for dinner. 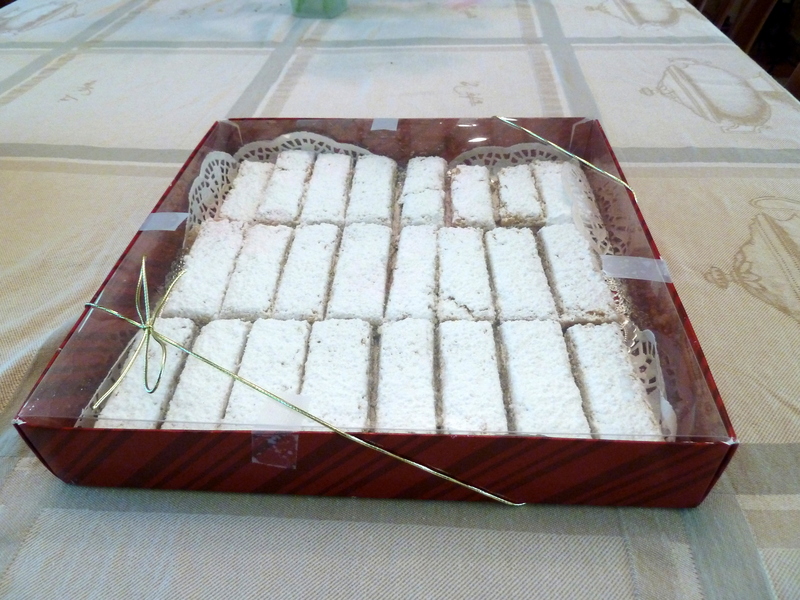 Can you think of a better gift than these beautiful lemon bars? This time I made them using whole wheat flour and they turned out great! I don’t think I’ll use white flour ever again! I LOVED the lemon bars!!!!!!!!!!!!!!! Mommy loves you and Thanassis so much that she can do wonders with her hands!!!!!!!!!! You are both the sweetest! Thank you! Thank you!